There'll be lots of hands-on weighing and sieving of materials and testing to build a repertoire of glazes and you'll glaze a group of your own forms. Samples will be yours to keep and materials and theory will be generally explained as part of making. (Note: This work will be done at mid-fire temperatures or earthenware depending on clays students are currently using - high fire tests can only be done if students have their own high-fire kiln). Bring an apron (or overalls or lab coat), a notebook and pen. Materials, including fired test tiles, are included but you may want to bring a kilo of your own clay for testing. 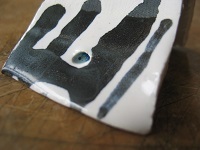 You may also wish to bring your own bisque-fired work to the application session on week 6. It's expected that students will have previously made pottery but no previous experience in glazing is assumed.